A none returnable £50 deposit secures your booking. Full balance to be paid 8 weeks before arrival if paying in full. For first time guests a £75 returnable damage deposit is payable with final balance. We also offer a savings club where we will keep a savings card for you and deduct any payments from your balance as and when you make payments. Your card should have a clear balance 4 weeks prior to your stay. No Pets unless previously agreed with owner, A charge of £15 per pet is required to cover cleaning. 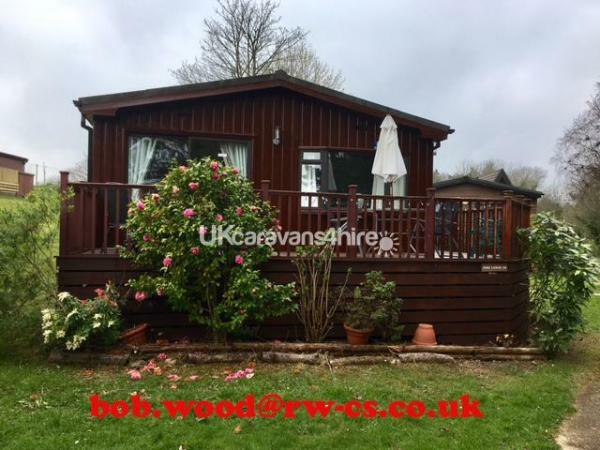 The Lodge is located in a quiet, peacefully, location overlooking the woods with views of the sea and Snowdonia mountain range in the distance. All amenities are within a 5 minutes walk and the sandy beaches are just a short stroll along the headland. 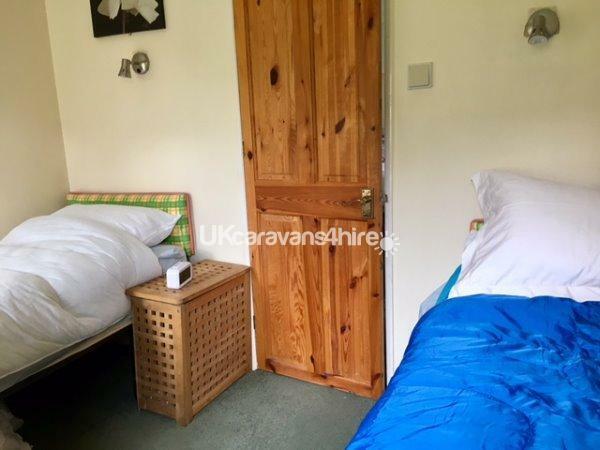 The Lodge has three large bedrooms; the first a double bed with wardrobe, the second twin beds with a wardrobe and final one room with a set of bunk beds and wardrobe. All pillows and duvets are provided but you have to bring your own pillow cases, duvet covers and towels. 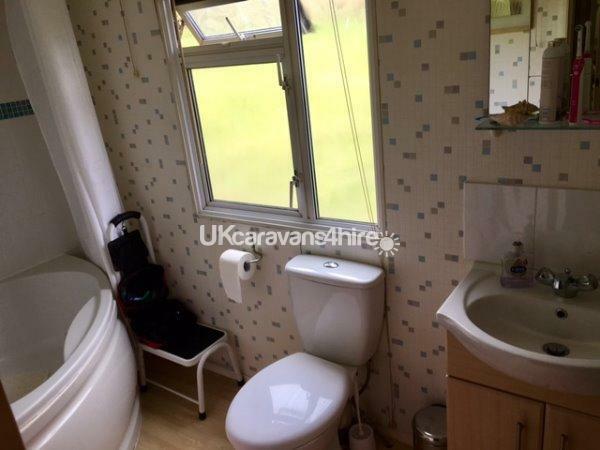 The bathroom has a large corner bath, overhead combie shower, toilet, shaver socket, mirrored cabinet and wash basin. A high power hair dryer can be found in the bedroom drawer, so no need to bring your own. 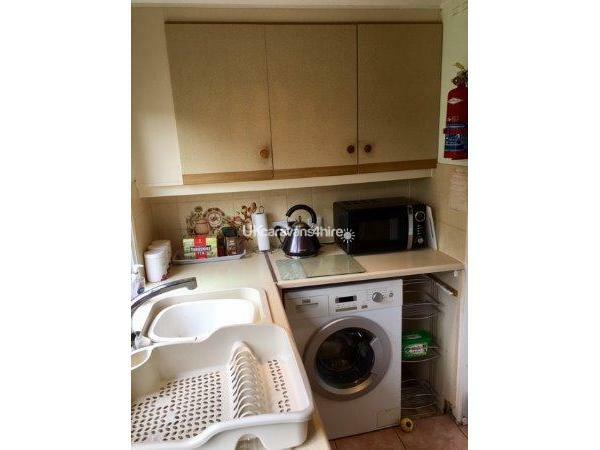 The kitchen is fully fitted with oven, grill, new four ring hob, fridge freezer, microwave, kettle and toaster. All cutlery, crockery, pots, pans, glasses and utensils are provided. The lounge/dining room is open plan with exposed roof beams proving a light airy feel. There is a dining table, with six chairs, three seater leather settee, two seater leather settee, and a leather stressless armchair. coffee table, real flame effect fire. 43" smart tv, dvd (loads of dvds) and playstation II (loads of games) for those rainy days. Free wifi in cabin, multiple devices,Netflix and U tube on TV. A sliding patio door leads outside onto the large wooden decking area, large artificial grass area just added, has an outdoor table and chair set to sit and relax in the sunshine. If you sit in the right position you can see the sea. BBQs NOT allowed due to fire risk. Our lodge is centrally heated and has double glazed window units thorough out. The Gas and Electric is provide free of charge within the prices. If its late night entertainment you are after the night clubs and shows are open into the early hours of the morning. 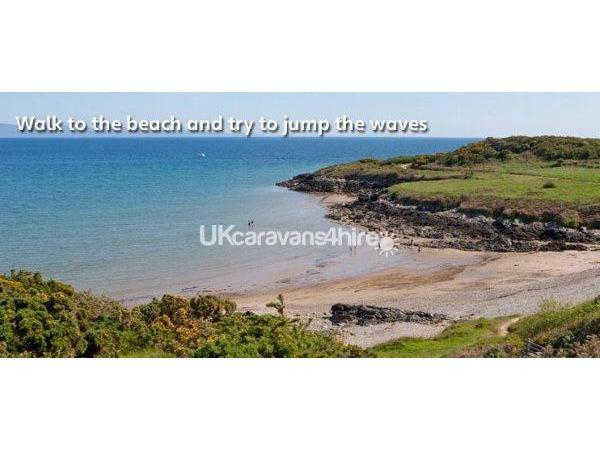 The site is ideally located to explore the beautiful surrounds of North Wales with Cricceth Castle, Pwllheli market town, Porthmadog, Abersoch, Portmerion Italian Village, Nefyn all within a handy quarter of an hour car journey away. We are sure you will have a fantastic holiday so book early book Now! Just returned from our second stay at this beautiful lodge, even though later in the year we still had an amazing time. After a long day visiting some of the gorgeous places in Wales it was great to go back to the lodge and relax and enjoy all the home comforts that makes this place so special. Once again we were sad to leave but will definitely be returning next year. Thank you Bob and Edwina for sharing your beautiful lodge with us. Returned from a week's break with a family member all having thoroughly enjoyed our time in your lovely lodge. Comfortable and spacious. Thank you. Currently staying at Bob and Edwina’s lodge, still got a week left and really don’t want to go home, this lodge is amazing, extremely spacious, I was shocked at how big it is, extremely clean and everything you need to make your stay excellent, my little dog loves the veranda, the bathroom is brilliant with the corner bath and the shower is amazing the power it has. So comfy and lovely and quiet which is what I love. Already checking out dates for next year. Thank you Bob and Edwina for letting us share your beautiful lodge, I will be in touch very soon to book for next year. We have just returned from a wonderful week at this lodge with our two children and dog. It is perfectly situated to enjoy the tranquil surroundings yet also close to all the amenities. Just a short stroll from both the beach and resort centre. All in all a perfect holiday and I can't recommend the lodge enough. Thanks to the Wood family for sharing their holiday home us. 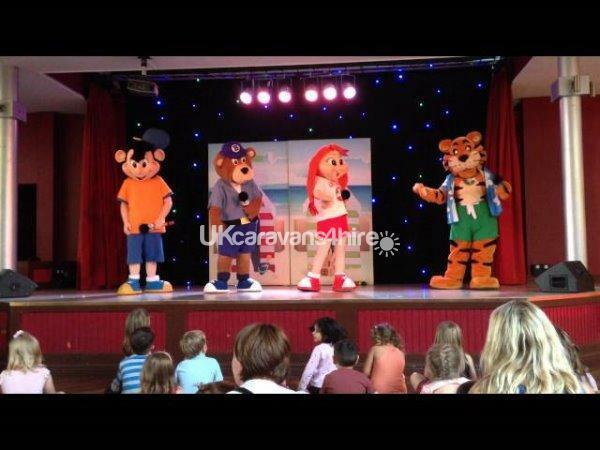 The lodge is a home from home in a lovely quiet location, 5 minutes from the beach which is perfect for small children. Lots of nice coastal walks for the dogs. The site facilities are excellent. We have had a great holiday. Thank you. 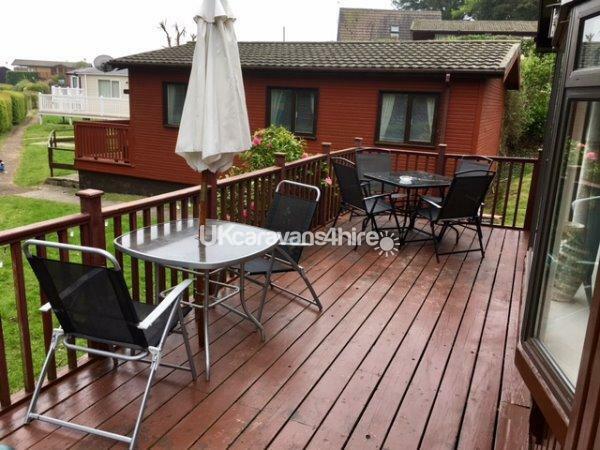 Excellent location, close to the coastal path & site facilities. The lodge is in a tranquil place. Loads for the kids to do and lots of places to walk the dog. Close to mountain biking places and Mount Snowdon. Hope to be back next year. Thanks Tony & Dorretta, you left the lodge spotless, it was a pleasure to do business with you. Just returned from a wonderful stay in this lodge it's everything you could wish for peace and quiet with all the comforts of home. It is immaculately clean and we'll maintained. 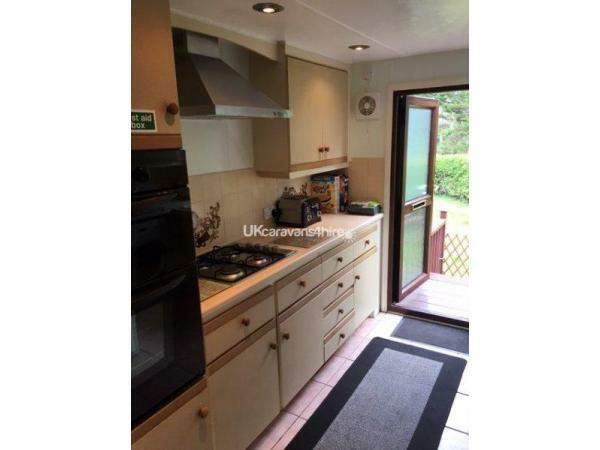 It was hard to believe that you was on a big site as the Lodge is situated in a beautiful spot with great views and close to a wooded area which attracted bird's and other woodland animals. It was so relaxing to sit on the veranda with a glass of wine and enjoy the views. We enjoyed it so much as soon as we got home we booked to go again. Booking the Lodge with Bob couldn't be easier with plenty of helpful information made checking in straight forward. 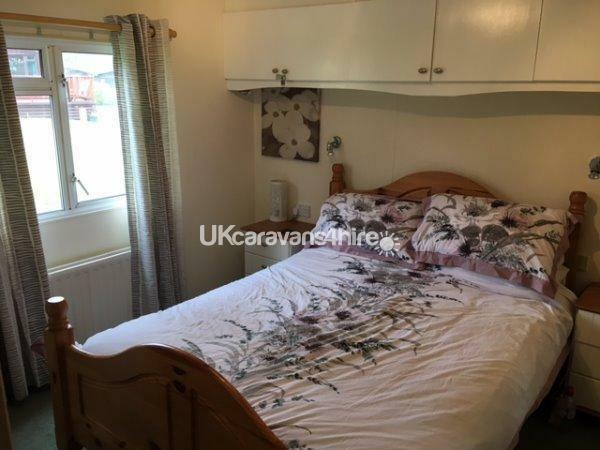 We used the caravan for a special event - it was absolutely perfect and everything was in place for a comfortable and cosy stay. It was March and pretty cold and wet outside, but the cabin was beautifully heated. It’s incredibly homely and yet its location means you really feel at one with nature, amongst the trees. I would love to go back and spend more time there with the family. Great shower too - plenty of heat and power. Thank you - we will be back. Just returned from an amazing week in this lovely lodge. It's just like home from home. There's loads of room and there's everything here you should possibly need. None of us wanted to leave. I enjoyed relaxing with a glass of wine on the veranda whilst the children played. A very safe and secure location with a picturesque beach within walking distance. Thanks to the Wood family for providing us with a great place to make special memories for me and my boys. We definitely will be returning! Thanks Simon glad you enjoyed it. 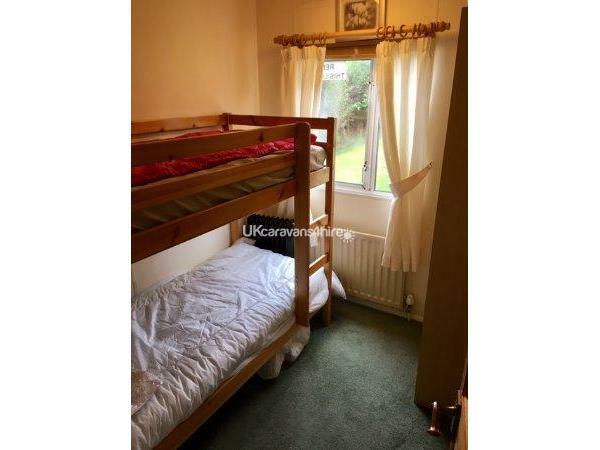 We had a last minute booking for 2 nights with my partner,my 8yr old son and 3yr old twin girls and the dog, situated in a brilliant spot, 5min walk to beach 5min walk to park and shop. The lodge was very lovely and homely a lot bigger than we expected and everything you needed was there. Will definitely be booking again. We booked the lodge for a little weekend away with our best friends and their son, we also took our dog. 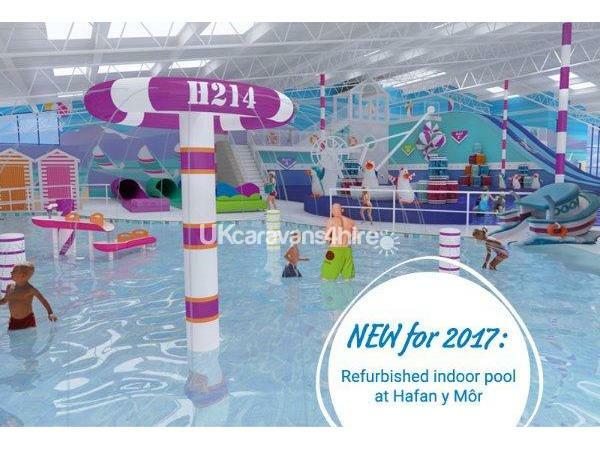 The lodge is perfectly positioned to give you easy access to the facilities on camp but also to allow peace and quiet of Wales. We were lucky with the weather so sat out on the varenda in the sun, admiring the gorgeous sceanary. The lodge is exactly as the pictures and was spotlessly clean and have everything we could have wanted. 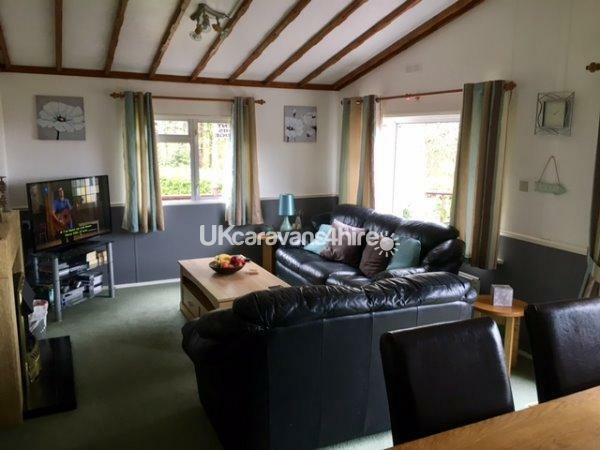 Lots of space and nice decor, we go to this Haven site twice a year and have stayed in a number of caravans and lodges but will definitely be returning to book this again, our friends have said the same. Easy booking with Bob and good communication throughout, would highly recommend, thanks again.